It probably isn’t going to solve all the world’s energy needs, but producing biogas from waste can help slash the energy bills at some production plants, sewage-treatment plants and even farms. And for those companies offering biogas technology, business is booming. For example, Eisenmann Anlagenbau AG & Co. KG (Böblingen, Germany; www.eisenmann.com) has been active in the biogas market since 2003, and the company says that international demand has grown considerably in recent years. More than 90 plants of very different designs of Eisenmann are currently in operation, including 20 biogas plants in Italy. Germany is the undisputed biogas champion, with over 7,100 of the estimated 10,000 biogas plants in Europe. These facilities account for 11% of the electricity generated in Germany by renewables, according to BioPro Baden-Württemberg GmbH (Stuttgart, Germany; www.bio-pro.de). The U.S. has over 2,200 sites producing biogas, according to the American Biogas Council (Washington, D.C.; www.americanbiogascouncil.org), including 186 anaerobic digesters on farms, 1,500 at wastewater treatment plants and 576 landfill-gas projects. Most of the thousands of operating biogas plants are using conventional digestion systems, which are basically large towers or tanks designed to process dry compost or wet sewage sludge and industrial wastewater by anaerobic fermentation. In these warm, sealed airless containers, bacteria metabolize organic matter into biogas, a mixture of carbon dioxide, methane and small amounts of other gases (H2O, H2S and NH3). Depending on the feedstock, the methane content will vary from 30–40 vol.% (for sewage sludge and manure) to as much as 80 vol.% (fats and oils). The biogas can be used — sometimes directly — as a fuel for heating, burned in a gas engine to generate electricity and heat (in combined heat and power (CHP) systems), compressed for operating vehicles, or cleaned up for injection into natural-gas pipelines. In Spain, for example, Sener Ingeniería y Sistemas, S.A. (Madrid, Spain; www.sener.es) developed its Valpuren process specifically for treating pig manure. This waste is normally used as a fertilizer, but in some rural areas, the livestock density is so large that the amount of manure is too much for this disposal option — the nitrogen levels in ground water can exceed E.U. Directives. The Valpuren process uses an anaerobic mesophillic (30–35°C) biodigestion of the manure to make biogas, which is used for cogeneration of heat and electricity, as well as a fertilizer in a form that can be stored (dry pellets). Biogas yields are increased by co-digestion with other waste feeds, such as those from food processors or slaughterhouses. Since the process was commercialized in 2001, five industrial plants are now processing 100,000 ton/yr of pig manure and generating 16 MW of CHP. Eisenmann recently designed a new composter with a biogas plant to convert an existing biomass-composting plant of the Swedish waste-utility Västblekinge Miljö AB (Mörrum, Sweden), enabling the company to convert 20,000 ton/yr of regional biowaste into 1,500 tons of fuel. When the facility starts up later this year, it will feature two horizontal plug-flow digesters, each with a capacity of 800 m3. These digesters are made of precast, reinforced concrete and equipped with special horizontal agitators. Operating at temperatures of 55°C (thermophillic), the system almost completely digests the feedstock within 25–30 days, while destroying potentially harmful pathogens in the process, says Eisenmann. Another biogas plant featuring thermophillic fermentation — one of the largest in Europe — has been designed and built by Farmatic Anlagenbau GmbH (Nortorf, Germany; www.farmatic.com) as a general contractor for Göteborg Energie AG. First feedstock was supplied to the new biogas plant in Skövede, Sweden earlier this year. The plant processes mainly slaughterhouse waste along with other industrial food waste at a temperature of 52°C, and can produce up to 800 m3/h of biogas, which can then be upgraded to 500 m3/h of biomethane. This biomethane will be used for fuel in cars and public transportation. While demand for conventional digestion systems continues to grow, anaerobic analogs of proven membrane bioreactor (MBR) technology have now been developed, which enables the processing of wastewater with very high levels of COD (chemical oxygen demand), but requires significantly less space, says Jan Pereboom, marketing manager at Biothane Systems International (Delft, The Netherlands; www.biothane.com) — a subsidiary of Veolia Water Solutions and Technologies. In the past, the option for treating industrial wastewater with COD levels of 20,000–250,000 ppm has been limited to energy-intensive combined anaerobic and aerobic treatment systems, or paying high external disposal costs. Now, a new option is available: Biothane’s Memthane process, which opens the door to treating high-strength, high-solids wastes found in distilleries, dairies (whey), bioethanol plants and coffee producers. Memthane (Figure 1) combines two proven technologies: Biothane’s anaerobic biological wastewater treatment and the ultra-filtration (UF) membrane separation technology of Pentair X-Flow B.V. (Enschede, The Netherlands; www.x-flow.com). Influent is fed to the anaerobic bioreactor where the organic components are converted into energy-rich biogas. Next, the anaerobic effluent is processed through the UF membrane unit, separating the clean permeate from the biomass. The biomass is returned to the bioreactor, while the ultra-clean filtrate is discharged as particle-free, low BOD (biochemical oxygen demand) and COD effluent, often at levels low enough for direct discharge to the sewer. 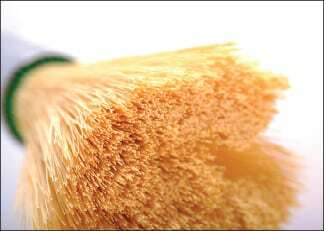 If required, several polishing techniques, both physical and biological, are available to further treat the suspended free effluent and recover nutrients, for instance by struvite precipitation. 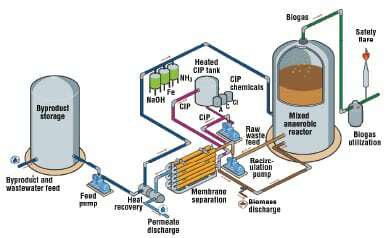 Incorporating the UF step into the digestion means all the bacteria are returned to the reactor, along with undigested biomass. As a result, a Memthane system achieves a higher conversion — 98–99% of the COD converted to biogas compared to 85–95% in a conventional digester, says Pereboom. This higher conversion means the size of the plant can be one half to a third that of a conventional digester treating the same waste stream, he says. Depending on the waste stream, the biogas produced can cover 40–60% of the production plant’s electricity and heat demand — and even 100% in distilleries, for example. Investment costs of a green-field Memthane system are equal to or lower than conventional technologies, while the overall operating costs are much lower for energy, chemicals and sludge disposal, says Pereboom. The soda costs for pH correction in the reactor are much lower in the Memthane systems. The first industrial-scale demonstration plant has been operating for four years at a dairy in the U.S. Since the Memthane technology was commercialized last year, the first four units are now under construction, and over 14 pilot plants have been built. The largest plant under construction is a 20,000 m3 reactor (for treating bioethanol condensate), which can generate around 6 MW of electricity. Eisenmann is also developing an anaerobic MBR, which features a rotating membrane disk filter developed in cooperation with the Fraunhofer Institute for Interfacial Engineering and Biotechnology (IGB; Stuttgart, Germany; www.igb.fraunhofer.de). Thanks to the Eisenmann ceramic filter, the high concentrated sludge is centrifuged from the membrane by rotation, which results in a high flux compared to other anaerobic MBRs, says the company. The technology has been pilot tested since 2009 in a 10-m3/d unit in Knittlingen, Germany, and plans are underway to treat up to 35 m3/d. 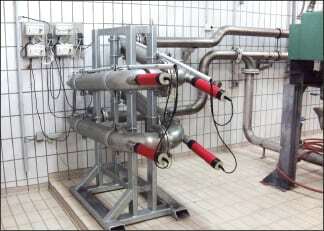 Another way to boost the efficiency of biogas plants is the BioCrack electrokinetic disintegraton technology (Figure 2), which was introduced by Hugo Vogelsang Machinenbau GmbH (Essen/Oldb., Germany; www.vogelsang-gmbh.com). Before entering the digester, slurries flow through the BioCrack module and are exposed to a high-voltage field generated by internal electrodes. The field breaks up agglomerations (aggregates and colloids) of dead bacteria and organic matter, thereby increasing the availability of the nutrients for the fermenting bacteria. By improving the utilization of substrates, gas yields are increased by up to 15%, says the company. BioCrack also reduces floating and sinking layers, as well as viscosity in the digester. This decreases the mixing and pumping requirements, thus reducing energy consumption by up to 30%, says Vogelsang. Since the technology was introduced in 2009, more than 23 modules have been installed. Last May, Lanxess AG (Leverkusen, Germany; www.lanxess.com) introduced Bayoxide E 16 — a highly effective synthetic iron oxide for reducing H2S in biogas — that can be added directly to the fermenter. Bayoxide E 16 reacts directly with H2S to form iron sulfide and sulfur, which together with the fermentation residue, can be used to fertilize fields. Because of the additive’s nearly 100% purity, it removes nearly all of the H2S (typically around 500 mg/m3, depending on the waste being fermented). As a result, a metering system is not required and the cost of secondary biogas desulfurization by activated carbon absorption is “significantly” reduced, says the company. Removing the H2S directly inside the fermenter also helps avoid damage from corrosion caused by the formation of sulfuric acid, adds Lanxess. An approach to reduce the amount of experimental work needed to optimize biogas yields has been demonstrated by AICOS Technologies AG (Basel, Switzerland; www.aicos.com) and Flensburg University of Applied Sciences (Flensburg, Germany). The method, called Statistical Design of Experiments (DoE) uses a mathematical approach to systematically tune various parameters, such as enzyme concentration, milling time, temperature, pH and so on, and predict gas yield, before actually doing experiments, says Philippe Solot, CEO at AICOS. The method, which uses Stavex software from AICOS, makes it possible to perform only the required experiments, in a structured way instead of having to “play the lottery of trial and error,” says Solot. Although conventional gas-sweetening technologies can be and are used to upgrade biogas for injection into natural gas pipelines, the added expense for chemicals and handling makes this option uneconomical for some smaller biogas plants. To reduce the costs and complexities, membrane separation is being developed as an option for both new and existing biogas plants. For example, MainSite GmbH & Co. KG (Obernburg, Germany; www.mainsite-service.de) has entered the biogas-purification market, and now offers membrane-based purification plants under the brand MainMethan. The plants combine the company’s experience in manufacturing of fiber-spinning plants — including those for membrane fibers — and in chemical plant construction to deliver optimized, economical methane-extraction plants. In MainMethan plants, CO2 is separated from the biogas using a special polymer membrane. The final product gas, with more than 97% biomethane, meets the requirements for input to the natural gas network. Unlike alternative separation methods, membrane purification requires no chemical additives or expendables. Low operating costs and maintenance are another advantage of MainMethan, because it requires only one compressor, says the company. Last year, Evonik Industries AG (Essen, Germany; www.evonik.com) commercialized hollow-fiber membrane technology, tradenamed Sepuran Green, for upgrading biogas to biomethane. The membranes, which look like spaghetti (Figure 3), are based on high-performance polymers (polyimides) that have been used in the past for hot-gas filtration, and optimized for the selective separation of CO2 (as well as H2O and traces of H2S and NH3) and from CH4. At pressures of up to 25 bars, methane of 99% purity or more can be achieved, says Evonik. Pilot trials of the new membrane modules have been underway since 2011 at an existing biogas plant in Neukirchen an der Vöckla, Austria. Since then, several larger pilot and first production-scale units will go onstream in the course of this year. Evonik has also invested “upper single-digit” million euros in a new fiber-spinning plant for producing Sepuran fibers at its Schörfling, Austria site. Startup of the large-scale plant is planned for Q4 2012. Eisenmann, too, has developed a new biogas-upgrading system based on Evoniks selective membrane technology. “This highly flexible modular process is ideal for low-capacity upgrading,” says Lukas Graf, a biogas-upgrading specialist at Eisenmann. “The throughput rate can be easily adapted to the [user’s] specific reqirements, and our equipment can be retrofitted to any biogas plant, not just those built by Eisenmann.” The upgrade becomes an increasingly attractive, economical option for plants that produce less than 500 Nm3/h of raw biogas. The first unit has already been sold to an existing customer, and this summer will process up to 210 Nm3/h of biogas — equivalent to the annual natural gas consumption of 430 four-person households or 800 LNG-powered vehicles driving 13,000 km/yr.